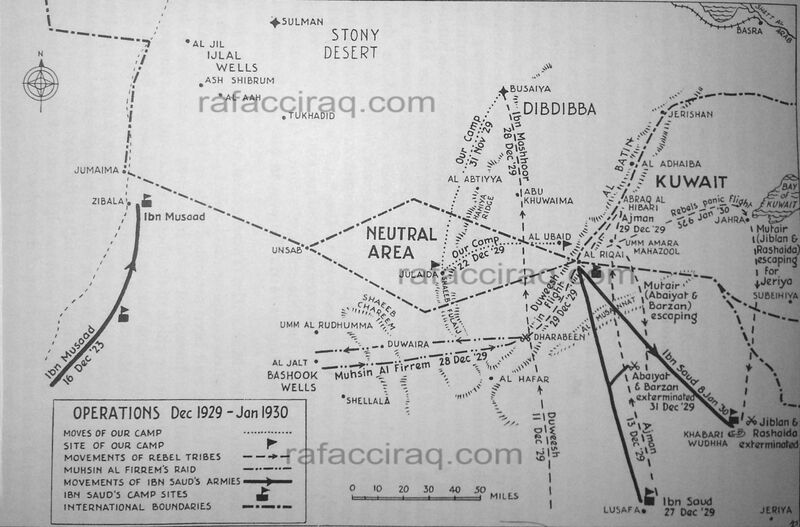 This map is from John Bagot Glubb's War In The Desert: An R.A.F. Frontier Campaign, a book well worth reading. On this day Armoured Cars (Car Column) operating in Southern Desert obtained touch with DAWISH and IBN HITHLAIN. The CSO in Command demanded their unconditional surrender. Feisel Duwish and Ibn Hathlain came into camp at Shaib al Auja for a conference with the Chief Staff Officer and Captain Glubb. A long interview with the Arab leaders followed. They were given terms of surrender but requested an opportunity to return to their respective tribes to discuss matters. After their depature, it was ascertained that they had no intention of accepting the terms given them by the CSO and that they were moving South-West through Kuwait territory. No 3 Section under F/Lt Ballard was ordered to proceed by road to SHAIBAH. Owing to the flooded state of the road it was found necessary to entrain the Section at RUMAITHA for SHAIBAH, arriving at SHAIBAH on 11.1.30. From SHAIBAH the Section proceeded to Car Column in the Southern Desert. Ibn Hathlain, paramount sheikh of Ajman, surrendered to the Chief Staff Officer at Jahrah and was immediately conveyed to Basrah by air. Feisal Duwish - who had gone South towards Najd, discovered that Ibn Saud's forces were in greater numbers than he had anticipated - returned to Jahrah and in company with Ibn Lami surrendered. Ibn Lami was given instructions to proceed to the tribes and compel them to carry out the orders given by the CSO as to their future movements. Feisal Duwish with a small following was on this day conveyed to Basrah by air. F/Lt C F Toogood with No 2 Section returned to Basrah and F/Lt R R Greenlaw MBE, assumed command of Carserve Column.